Here are five things to consider when selecting software to improve manufacturing. In a manufacturing environment companies are always looking to increase efficiencies, reduce waste, shorten lead times, reduce inventories, and reduce costs. This can sometimes be difficult to do without having negative impacts on product quality, employee morale, and lost sales due to inventory stock-outs. Advanced Enterprise Resource Planning (ERP) systems can help with this and the right one can make a huge difference in your operations. 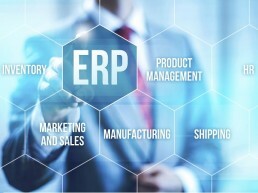 For some, complex on-premise ERP systems were more bother than they were worth. Early systems required installing a special computer server in your facility to run the software. They also required a significant IT support staff to apply software updates, make backup copies of your data, set up new users, and answer questions. They could also be complex, hard-to-use, inflexible, and hard to adapt to changing business conditions. In addition, their expense could be considerable: not only initial software acquisition costs, but also vendor maintenance fees, power and cooling utility bills, and support staff salaries. Fortunately, a new breed of modern cloud-based ERP systems is now available. These systems are easy-to-use, lower in cost, and provide the real-time data a company needs to run their business. By running remotely on the cloud, one can achieve several advantages. First, you will be able to access real-time data on your business operations 24/7 from anywhere there is internet access. Data safety is guaranteed by the cloud provider, and even if there is a power failure or Internet disruption, you will not lose any data in the system. Real-time data gives you much better visibility into your company’s operations. Not only that, but you can access it from any web browser in any computer or even your smartphone. Many common functions including automatic updates, data backups, and security are handled automatically by the vendor so you don’t have to worry about them. There are no initial software acquisition or computer hardware costs and the monthly access fees are priced at a very cost competitive level. So not only are the costs low, but the benefits with the right system can be considerable. Properly design cloud-based ERP systems can be set up very easily, and you can get it running in a matter of days. They use modern graphic interfaces that are intuitive and don’t need complex secret command sequences to get the data you want. Because the interface is easy to use, new employees can be easily trained and productively start using the system very quickly. If you decide that an upgrade of your manufacturing systems are needed, what should you look for? Here are some tips to help you determine this. First, a cloud-based implementation is the best approach today for all but the largest organizations. The objective should be to focus your resources on the unique activities that make you a successful business rather the ancillary functions that can be performed elsewhere. Companies shouldn’t have to worry about installing hardware, applying software updates, making daily backup copies of your data, apply security patches, and paying utility bills for electricity and cooling if those functions can be performed by specialty cloud providers who can do these things on a massive scale and much more efficiently. Second, you­ should make sure the solution is easy-to-use by the actual employees who will be using it. The interface should be intuitive so they can figure out how to do something without trying to decipher a 1,000-page manual. It should not use complex command sequences that are hard to remember. They should be able to access any piece of data they need with at most two or three clicks. The system should be easy to set up so you can achieve productive use very quickly. It should have the capability to import data from your old system or manual records via an Excel spreadsheet. It should also have the capability to export data to either a PDF file or Excel spreadsheet, or just show the data on the screen—so you can use it to either do further data analysis or communicate invoices, packing lists, and other information to your partner customers and vendors. Another important feature is having a system that contains full integration with other modules that support other functions in your business. Some companies will have separate system that support different areas like sales, finance, manufacturing, purchasing, etc., and then they must write interfaces that allow one system talk to the others. In some extreme cases, there is no software to exchange the information so the data needs to be transferred manually. Some companies will even need to have a data clerk manually enter in the same information multiple times because two different systems need to have it. Not only this is highly inefficient, but it can potentially lead to more errors if the information is not consistent. Having a seamless connection between different modules will not only eliminate these errors and reduce employee workload, but it will speed up operations because the data communication will happen instantaneously. Another important attribute is the ease of customization to allow the software to adapt to your business. Modern systems are designed with a flexible architecture that can allow changes to be easily made to adapt to the particular needs of your business. Other, older systems are not so easy to change and ultimately forces the user to adapt their business to how the software operates rather than the other way around. Yes, the data should be held in a secure fashion that prevents any external hackers from accessing or changing it. But the system should also have the capability of providing “need-to-know” access to individual users within your company so that information is not misused. For example, you certainly will want your sales team to access the sales and the customer relationship management (CRM) modules, but you may not want them to have access to the cost information for a product. You should also look for a system that supports advanced capabilities including multi-warehouse support, bar coding, and electronic data interchange (EDI). Even if your company does not currently use these functions you should keep an eye on growth and select a system that will support you for many years as you grow. And finally, rigorous job scheduling capabilities in a production environment are critical. Many manufacturing processes consist of a number of steps, and each step may have a dependence upon completion of a previous step that may, for example, produce a needed sub-assembly. The ERP system much be able to understand this and not try to schedule a production activity before the needed input components are available. So choosing the right ERP system for maximum benefit does take some thought. Not only should you think about how you currently run operations, but you should also think about how you might change operations for improved efficiency if a more powerful ERP software were available. Also think about growth to ensure that whatever software you choose is scalable and can support your company for many years to come. Although an ERP vendor can make implementation a little easier, you still don’t want to have to go through this process every year. Keeping these tips in mind will help you make a successful selection and pave the way for smoother running operations in your business for many years to come. This blog was written by My Office Apps’ very own Vice President of Marketing, Doug Finke. The original blog was published on: Machine Design.